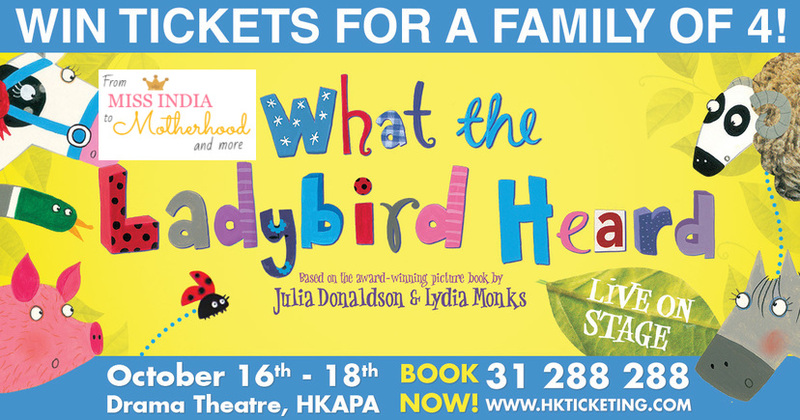 Kenny Wax Family Entertainment and ABA Productions proudly present What The Ladybird Heard! Back by popular demand following their last appearance at KidsFest Hong Kong 2014, the show is ready take Hong Kong by storm again. Based on the award winning picture-book by Julia Donaldson and Lydia Monks, What The Ladybird Heard has attracted many young hearts with its interactive and witty story. In a farmyard full of noisy animals (MOO! HISS! BAAA! CLUCK! ), there is a quiet ladybird, who never said a word. So go ahead and quickly fill up this form to grab this chance and be the lucky winner! Sorry this Giveaway has closed now but please subscribe to our newsletter to stay updated for the next one. This giveaway closes on Tuesday, October 13 at 22:00 hrs and the winner will be contacted via email. Terms & Conditions: All entrants must be aged 18 or over and reside in Hong Kong. It will be From Miss India to Motherhood’s sole decision as to whether any eligibility requirement has or has not been met and we may require evidence or confirmation from entrants before awarding prizes. Prize tickets need to be collected directly at the show. Prize tickets are for this particular show, date and time only and cannot be changed under any circumstances. Data Protection: By signing up for a From Miss India to Motherhood Giveaway, you will be added to our mailing list, so you can receive free newsletters and updates from us. We promise to never share your email address with third parties unless you give us permission to do so.